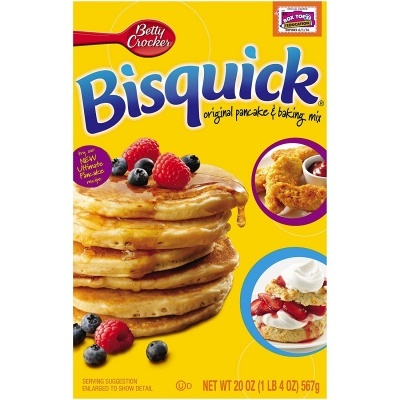 BISQUICK- Original Pancake and Baking Mix is the classic you can count on for tasty and easy-to-prepare dishes. Create family favorites with what you have on hand. Real pancakes, real good. 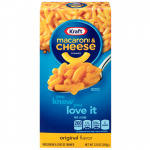 Enriched Flour Bleached (Wheat Flour, Niacin, Iron, Thiamin Mononitrate, Riboflavin, Folic Acid)Partially Hydrogenated Soybean and/or Cottonseed Oil, Leavening (Baking Soda, Sodium Aluminum Phosphate, Monocalcium Phosphate)Dextrose, Salt. *Produced from genetically modified maize. **May have an adverse effect on activity & attention in children. I have not used this product yet waiting to use it, and when I do I will make a stew because it makes great dumplings and I make enough to fill the surface of the pot yum. A wonderful product inused to buybin supermarkets. No longer stocked anywhere like that now. This wonderful company not only stocked it but got it to me within a couple of days very securely packed. Would recommend this Company very highly. They certainly are 5 star. I love using this product especially for pancakes and have been quite disapointed not to be able to purchase in any of my local supermarkets. To know I can now purchase online from American Foods, I will be placing a regular order.